I’ve worked with all of the lines (Multi, Kettle, Speckle, and our new Tonal) and I just love all of the finished projects. Since I’ve been using it in so many projects, I thought I’d reshare some of tips & tricks for working with what can be a challenging yarn to some people – Hawthorne Multi. While Tonal, Kettle, and Speckle will look great in most patterns, the colorful Multi can be an adventure to find the perfect project. Oh boy, are we excited here at Knit Picks! Today our new catalog launches, and it has some very fun new items I think you are going to absolutely LOVE. Read on to see what’s exciting & new for Summer 2017! I have been fortunate to have many creative teachers, this post helps you get to know me and my creative background a lot better! 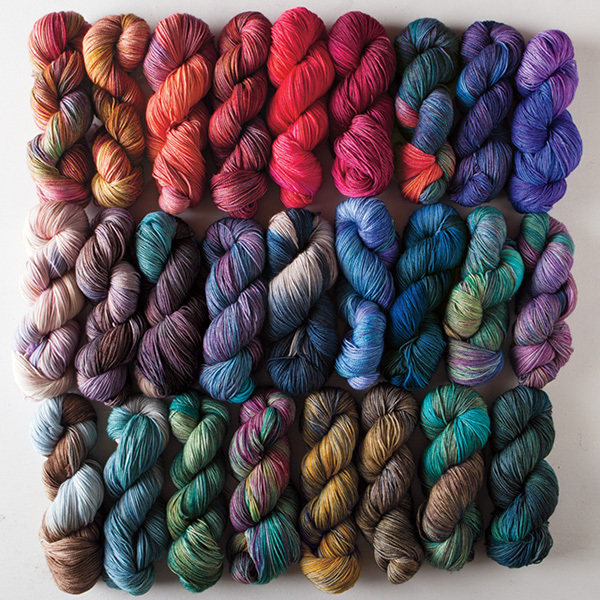 It is hard for me to adequately convey how excited I am about our upcoming Hawthorne yarn updates. Keeping it a secret has been close to not peeking at the Christmas presents when I was a kid. Just because I CANNOT WAIT until this Wednesday when we realize them, here is a sneak peek of the delicious hand painted hues coming soon! Roar! Calling all of those born under the sign of the lion, the seventh pattern in our free year long Zodiac Dishcloth series is for you. Check out the great Leo Dishcloth by Beth Major.